Alice (Milla Jovovich) continues her fight against the Umbrella corporation while also looking for a safe haven from the zombie apocalypse. "Resident Evil: Afterlife" is written by Paul W.S. Anderson, who also resumes his position in the directors chair after a two film layoff. 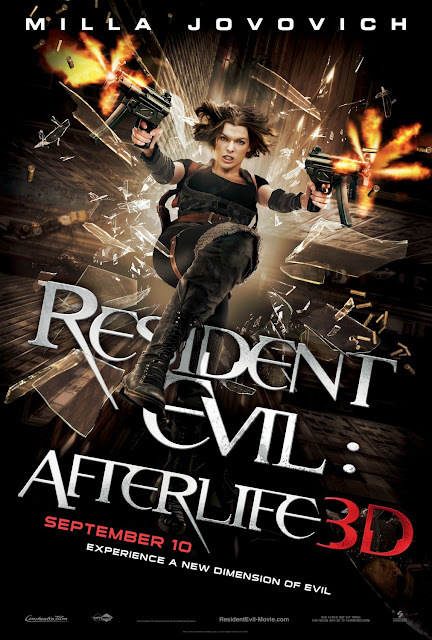 Milla Jovovich returns as Alice, the former Umbrella security agent and now genetically enhanced super soldier who is living out her days in the zombie apocalypse. This movie picks up where the previous one left off, in an underground Umbrella facility in Japan. In an over-the-top opening action sequence, the facility must fend off an attack from Alice and all of the Alice clones that were introduced in "Resident Evil: Extinction." The clones run around performing gravity-defying stunts, using their Jean Grey-like telekinesis to fight off the endless onslaught of soldiers Umbrella has in their arsenal. Towards the end of this comical action sequence, the real Alice pops up and is surprise-injected with the T-virus antidote by Mr. Smith-knockoff Albert Wesker, played terribly by Shawn Roberts, taking away all her previous super powers, which begs the question, why even give her powers if they were only going to take them away? Now that Paul W.S. Anderson is back at the helm, we see a return to the slower pacing that was present in the original "Resident Evil." It opens with a balls-to-the-wall action sequence, then slows back down as Alice heads to Alaska searching for a safe haven. Rejoining her there is Claire Redfield, played by Ali Larter, who despite first popping up completely covered in mud and disheveled in appearance, shows up in the very next scene with washed and styled hair, perfectly done makeup, and freshly washed clothes. That's continuity for you. From there, "Resident Evil: Afterlife" features a lot more slow searching and a few more character introductions, though as is true for all of the "Resident Evil" movies, none of these people ever truly really get developed. From there, there are a series of massively contrived plot points to drive our protagonist towards another showdown with the Umbrella corporation. "Resident Evil: Afterlife" manages to be just as dumb as all of the previous installments while being far less fun. Now, it's even more full of even more terribly CGIed dogs and "Predator"-like zombie tongues lashing out at their victims in a dopey way. At this point, getting through this series is becoming increasingly more difficult than we anticipated, and our enthusiasm for the upcoming "Final Chapter" dwindles with each installment we watch.